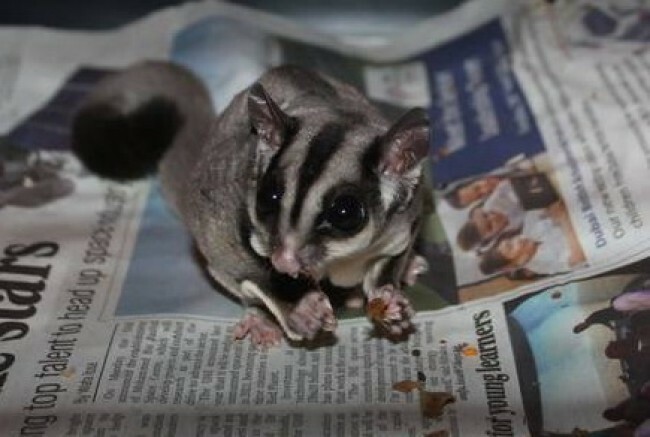 Sugar Gliders are sugary sweet pets. Yum! Okay, so we're a little prone to flights of fancy but the Glider really is a groovy little pet who'll keep you enchanted for its long lifespan - which is from 12 to 15 years in captivity. They're not keen on solitude, so chances are, if you decide on a Sugar Glider as a pet, you're going to have a band of mini-super heroes doing cage acrobatics through the night for many years to come. Ain't that grand? The translation of the Sugar Gliders Latin name Petaurus Breviceps is "short-headed rope-dancer" - pretty accurate once you see them getting their groove on and jumping/gliding about. They're also known as Sugar Bears or Honey Gliders. So you'd think they'd be keen on sweet stuff, right? Indeed they are! More on that later! The Petaurus Breviceps is a marsupial (the females have pouches) originally hailing from Australia. They're a soft-furred possum, 15-18cm long, with a useful and expressive bushy, prehensile tail (approximately 18cm long). They're nocturnal, so bonding and playing will mostly happen after dark, although they're small enough to accompany you during the day in a pouch or pocket - how neat is that? Setting up a lovely habitat for your Glider is quite a big investment but this is an area where you don't want to cut costs; the wrong cage can cause irreparable harm (is that alarmist enough for you?). While young Sugar Gliders will be fine in a large bird cage for the first few months, after that the minimum sized cage for a pair of gliders is 90cm high by 60cm wide, with no more than 1.3cm space between the bars. In fact, though, the bigger the better - just picture super-Sugar-Glider-rope-dancing and gliding for 50 metre stretches in the wild and you'll want to "go large". The enclosure should have mesh bars for climbing, not just one way vertical bars as Gliders' feet can slip and their foot pads tear. Avoid galvanized steel cages as rust can cause urinary tract infections. No cheap paint coatings which can flake off and cause zinc poisoning. Sugar Gliders are happy in temperatures of around 24C; if you have serious aircon (or live in a cool place), you may need a supplemental heat source inside the cage. Heat lamps or heat rocks do the trick. Lighting: Don't put the cage next to a window or an area which gets direct sunlight; find a place in your home where the warmth is constant. Toxins: Even small doses of household fumes can be detrimental - so not in or near the kitchen please. Noise: A healthy Sugar Glider doesn't really make a huge amount of noise but they can be vocal at nighttime playing with their toys, so only get quality exercise wheels and limit the squeaky playthings. Sugar Gliders are extremely social creatures and want to be in the middle of the action, so place their cage somewhere where there's people activity and you won't need a TV in the evenings - they're super-entertaining. Sugar Gliders need to be socialised. They've gotta whole lotta love to give and if you spend quality time with them they'll grow to trust you and form a strong bond - so... *responsibility* alert... you need to honour that trust. If you're patient, they'll eventually be putty in your hands (well, not exactly, but you know what we mean). We strongly recommend that you only adopt from the ages of 8-12 weeks old, and because they're so sociable, taking two Sugar Gilders at the same time would be a winning combo. Baby steps first: Take the baby "bear" Gliders out of their cage and handle them as much as you can. They relate to smell, awake or asleep, so use an old t-shirt or a fleece that's been rubbed all over the family (neat, hey?) and put it in the cage for them to nestle in, or perhaps drape it over the cage. Don't be intimidated - they may try to act "tough", trying to resist you, but gently and firmly show them who's the (loving) "boss". For the first bonding session, just hold them in your cupped hands. Take your time, go slowly. If you are patient they'll fall asleep. Next step is letting them move around in your hand, one thumb underneath their chin. From then on, it's patience. Training your Sugar Glider to be totally comfortable with you could take anything from weeks to months... but they're worth it. Oh, and don't be surprised if you get a bit of poop or pee on you during this process (that's life, eh? ).